To display section breaks so you can delete the ones you don't want, use Show/Hide. On the Home tab, in the Paragraph group, click Show/Hide . 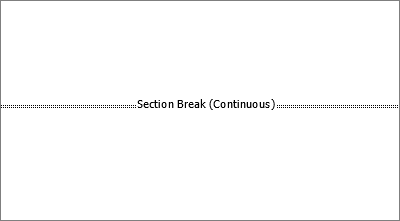 Note: The type of section break shown above is a Continuous section break; there are other types of section breaks. To delete, place your cursor just before the section break and press Delete. Note: When you delete a section break, Word combines the text before and after the break into one section. The new combined section will use the formatting from the second section (the one that followed the section break).